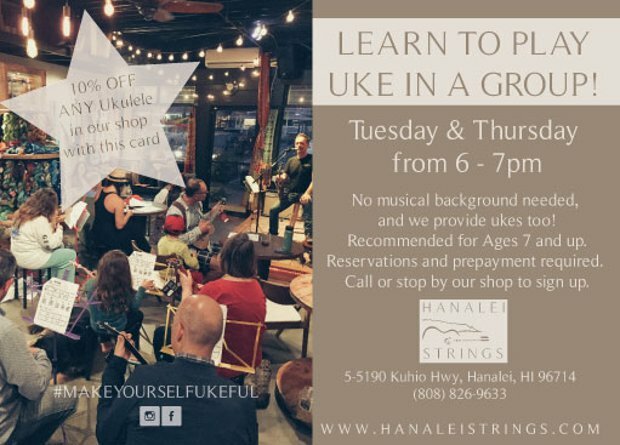 Hanalei Stings is offering group lessons in ukulele every Tuesday, Thursday, and Sunday at 6pm! No musical experience required and only $25 a person! It’s a one time, one hour lesson and you’ll leave knowing all the basics. They supply the instrument for the lesson, and if after you decide you want to purchase one you’ll receive 15% off. After a fun filled hour, you will be on your way to playing thousands of songs. Music is easy and everyone can do it!